The business list here are paid members of the Brewster Chamber of Commerce. This diverse group of businesses and individuals is dedicated to building buisness and celebrating this community. Anna Marie is a Realtor in Brewster and the current President of the Chamber. Welcome to apple country! The Brewster Marketplace is located along Highway 97 in the heart of a charming apple farming community, with the picturesque Columbia River as a backdrop. We are a family owned and operated business that has served Brewster and the surrounding communities since 1985. We pride ourselves on presenting the cleanest store and providing the BEST, one-on-one, customer service in the area. Produce is received 6 days a week, so it is guaranteed to be the freshest around. We proudly feature USDA Premium Angus Beef in our Meat Department, an in-store Subway, full service Bakery and Deli with a seating area. In our Deli, we have pizza made fresh, either Take & Bake or hot from the oven! Our Service Department offers DVD rental, UPS, floral, money orders and Western Union. Don't forget to check out our food aisles. Stop in, visit, and see our smiles!! The Upper Columbia Derby Fund is a 501(c)3 Non-Profit Organization. All charitable contributions are tax deductible to the extent allowed by law. 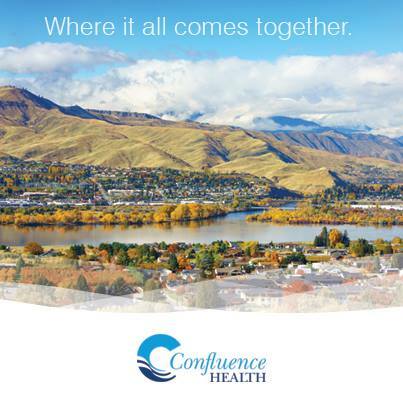 Confluence Health provides a wide range healthcare services to residents and visitors of North Central Washington state. Our Brewster Clinic offers care in Anti-coagulation, Cardiology, Dermatology, Ear, Nose & Throat, Family Medicine and Vascular Surgery. The clinic has four board certified providers and two mid-level practitioners. Gamble Fitness is a locally owned fitness center. Our motto is "COMMIT TO BE FIT!" We offer cardio, weights, boxing, locker rooms with showers, free wifi and a friendly staff. What would you buy with $2? A candy bar? A soda? Maybe that daily trip to the coffee shop? What about a gym membership!??! For as low as $2 a day you could start improving your health today! Gebbers Farms has become one of the top apple growers in the northwestern U.S. and the largest provider of cherries in the world for two reasons: quality and freshness. With many thousands of acres of engineered orchard and strategically located high up at the base of Washington state’s Cascade Range, the renowned Gebbers family has practiced the art of freshness for well over a century. Our growing seasons offer cooler days and crisp nights – ideal for growing fragile fruit like apples and cherries. We proudly tend – and are constantly improving – one of the biggest contiguous apple orchards in the world and have become the largest supplier of late season sweet cherries that are simply second to none in quality, freshness and taste. Serving all of North Central Washington with the most up to date news & information alongside the best mix of music. Listen on the FM dial at 93.5, 100.9, or 103.1. Listen on the AM dial at 1230. For more than fifty years KOZI has been North Central Washington’s Community Station. Start your day with the latest local news, weather, business and Ag news, plus sports, and headlines from around the nation. Following the Morning News join us on the 2nd Cup of Coffee with host Jay Witherbee. Stay with KOZI all day for music from the 70’s through today, trivia contests, and as much light-hearted fun as we can squeeze in. In the summer months, we bring you all the current wildfire details in North Central Washington. Our lures are almost all double treble hooks and as you know the hooks catch on everything. So after some different designs,trial and error and with suggestions from friends and family we have refined it to this simple, durable product. We now have a grommet for hanging them or carrying them on a carabiner. I use them on all of my lures in my tackle boxes and of course when we are going fishing. The lure cover wraps around the lure and pole. We have 3 x 3 inch covers for small tackle up to extra large 14 x 13.5 inches for the bigger bulky tackle. Custom orders are most welcome. And we always offer free shipping. Specializing in "Man Cave" decor, Poo Pourri, Candy, Kendamas, Games for the entire family. Three Rivers Hospital is a public, not-for-profit, critical access health care center serving a district bridging Okanogan and Douglas Counties, from Mazama to Monse to Mansfield. Continuing a 68-year tradition, our vision is to be a trusted community partner, providing excellence in healthcare. Our dedicated, professional healthcare team strive to create the ideal patient experience by providing compassionate, safe and respectful patient care. Our Mission is to lead the innovation of safe and respectful patient care with a compassionate culture supported by our dedicated, professional health care team. Today we have over 300 locations across the West and new leadership from CEO Cort O'Haver, who carries on our legacy of supporting our customers and communities every day. Our Local Spotlight program invites small businesses to sell their goods in select stores, and we pass along all the proceeds. Our podcast "Open Account" tackles America's No. 1 source of stress through honest conversations about making, losing and living with money. And our stores continue to host community events, from neighborhood meetings to art openings. We believe in the potential for greatness in each and every one of us, and everything we've done -- and will do -- is built to help us grow together. No matter where we're going (and growing) as a bank, we'll always stay true to our core ideals: Be a good neighbor, go the extra mile, and take care of our customers, our community and one another. We work with no less than the best manufacturers to bring you quality products.Browse the online catalogs of all of our major manufacturers, and you will be certain that we team up with the best in the business when it comes to bang for your buck. Our suppliers deliver reasonably priced goods without ever compromising on quality craftsmanship. We always want our customers to get the most out of their purchase. If you have any questions, or would like any more information on specific products, get in touch with us, and we’ll be happy to help.